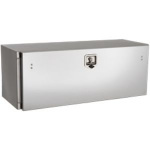 Durable, corrosion-resistant construction with a 16 Ga stainless steel body and door. Features an attractive mirror-finish stainless steel body and door for both style and strength. Protect against weather and theft with locking, die cast compression latch. Can be mounted on either a flat surface or under-bed. Built for long life with aircraft grade cables and a replaceable gasket sealing system. 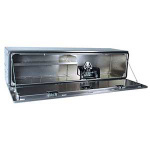 Protect and secure your equipment for the long haul with this Buyers Products Stainless Steel Underbody Truck Box. This easy-to-access, professional grade underbed truck box is crafted with 16 Ga stainless steel with a reinforced, recessed drop door. Its locking, die cast compression latch helps keep your tools protected from theft. It's built for long life with aircraft grade cable lanyards, stainless steel continuous hinges, and a watertight gasket system. 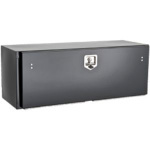 Phoenix USA SSTSD48A Stainless Steel Tool Box 48"
Phoenix USA ST3MRD60 Black Tool Box 60"
Gloss Black Powder Coated Steel Body and Door.